So it’s the start of a new month & I’m here to present the Traffic Stats of the previous month. 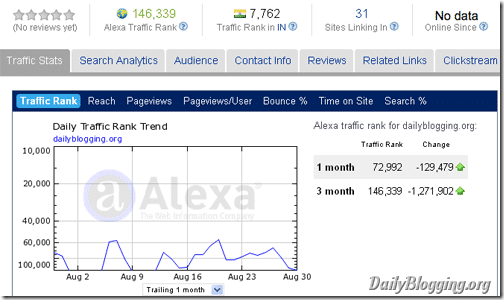 Last month we had posted our first Traffic stats for July 2010. It was our first solid month into serious blogging. In that I had promised that we would move even further & we have certainly almost doubled last month’s stats. The only thing that bothered us this month is the post frequency. I will reveal it soon in our Monthly Wrap-up. Though I’m not much worried by that as the posts which were made, brought enough traffic to cover the post frequency factor. I really very impressed with the unique visits we got this month & the highest one being 403 which we got on 17th August for the Mumbai Earthquake post. Though there are many fluctuations in the unique visits each day, we manage to get above 130 UV each day. Now my goal for this month is to achieve around 180 UV’s/more per day. Hope we can achieve that target soon & be consistent with that stat throughout the month. As I said earlier that this month we have doubled stats as compared to the previous month. 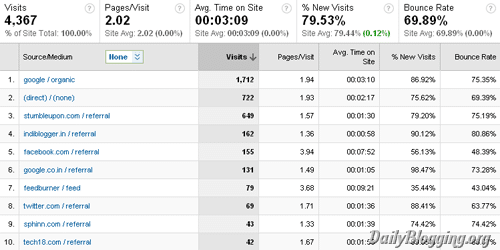 Still Organic traffic dominates the traffic stats list. We have improved our Subscribers too but still not improvement in terms of the traffic coming from our Daily Newsletters. I’m happy to announce that this month we could manage to cross the 1 lakh barrier though not the 3 month wise but for the period of 1 month. So, from this month I will be posting the Alexa rank with the Trailing 1 month rankings as seen in the image above. This month I’m hoping to see it cross the 1 lakh barrier for the 3 month period & get DailyBlogging into the Elite club of Alexa. Though we are still waiting for the PR update. Hope Google updates the PR by mid September or maximum by the end of September. Do you have any tips that I should implement ? Also, I would love to see you share your traffic stats with us using the comments section! hmm nice idea Rahul. But as its a new blog & I hav’nt got approved in Adsense, I’m a bit reluctant to share the earnings. Though from this month onwards I may share them 😛 Look out for them! Quite impressive statistics bro, You are doing quite well keep up the great work. Thanks Avi. Yup I usually submit my posts to Indiblogger. I don’t follow anything special there. People promote it on their own. Maybe the trick is the categories I write the post in, which people tend to like. 403 UV/day is great.. My highest was 371 only . I looking forward to more 400 UV/day in this month 😛 Hope the same for ur blog too.! Not trying to boast or anything but here I am, a 16 year old blogger with a mere 110 posts with a blog on WordPress.com and get twice as much traffic as you are getting. Where are you lagging? You are doing great job mani! Amazing, compared to mine you have better traffic. 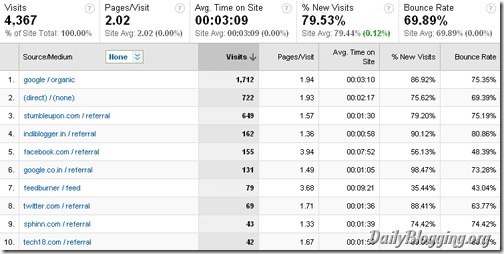 Most of my traffic is from 5 post other dont have good ranking..
plus you have better page views. great man! does this traffic convert into sales of products that you offer?